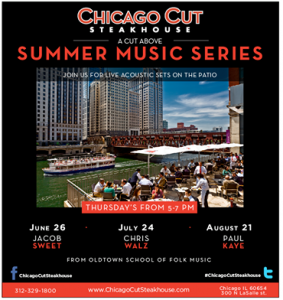 Chicago Cut Steakhouse is excited to announce the kick-off to their Summer Music Series on their breath taking patio. Beginning this Thursday, June 26th guests can leave work on Thirsty Thursday and enjoy live music from Oldtown School of Folk Music artist Jacob Sweet. Stella Artois will be on hand sampling out their portfolio and guests can enjoy the view and sounds while enjoying what the restaurant is best known for: Great Food! Try the savory summer dishes like the Lobster Salad with Maine lobster, tomatoes, corn feta and champagne vinaigrette or the Pan Seared Diver Sea Scallops made with butternut squash risotto, brown butter, and fried sage.